This dish is known as , Murgh Saagwala, Sag Murgh, Spinach Chicken Or Sag Chicken etc. Chicken Saagwala which is a very popular North-Indian dish of roadside dhaba. 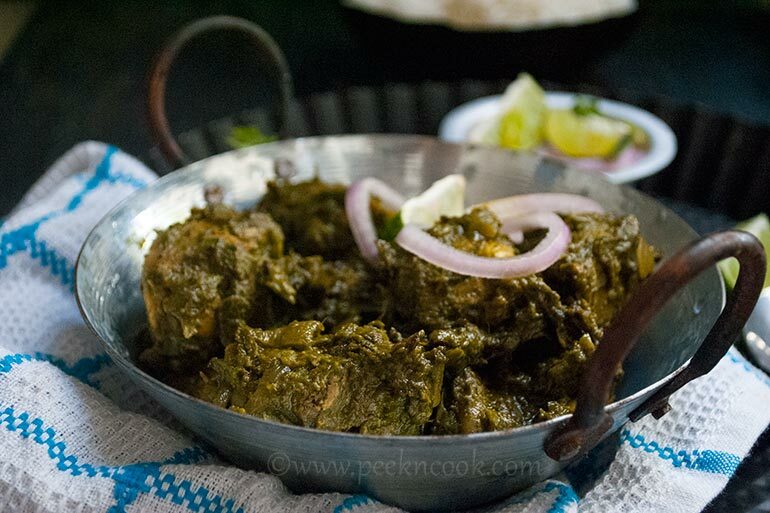 This dish is known as , Murgh Saagwala, Sag Murgh, Spinach Chicken Or Sag Chicken etc. Take the chicken, wash under tap water and rinse well to remove excess water. Now put the chicken in a bowl, add lemon juice, salt, turmeric, and chili powder and marinate the chicken well. Keep aside for 1 hour. After 1 hour take a pan, heat oil, and add the chicken pieces, and keep frying on medium heat. If you're using bone-in pieces, cover the pan while frying to make the chicken soft and tender. Take the fried chicken pieces out of the pan and keep aside. In the same oil, add finely sliced onion, little salt and keep frying on low heat. Fry the onion till the onion looks golden , add ginger and garlic and keep stirring. Now add the blanched spinach, chopped red chili and give it a nice stir. Now let the spinach cool down completely. Now make a smooth paste of the spinach mixture, add little water if needed. Now heat oil and ghee in another pan, temper the oil and ghee with bay leaf, cinnamon, cloves, cardamom powds and cumin seeds and fry for a while till a nice aroma comes. Add onion paste to the pan and keep stirring till the onion paste is fried. Now add spinach paste to the pan and cook the paste very well. Keep stirring till the oil oozes from the mixture. Add turmeric, cumin powder, coriander powder and red chili powder, sprinkle water and stir everything. Add salt and sugar as per your taste. And add the fried chicken pieces, stir everything for 1 minute. Add 1/2 cup warm water and let everyhting cook on low heat for 2 to 3 minutes. Add crushed kasoori methi and fresh cream on the top and leave the curry for a 10 minutes standing time before serve. Don't cover when the curry is hot, the spinach gravy will turn black when it's covered hot.